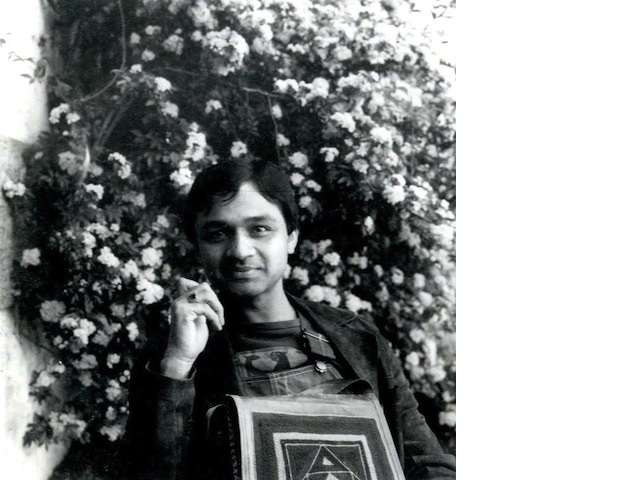 Editor’s Note: The following essay has been published to coincide with the 12th anniversary of Agha Shahid Ali’s passing on December 8, 2001, and to recognize and celebrate the influence he continues to have on many contemporary writers and poets. It has been adapted from remarks made by the writer, Sejal Shah, at the University of Massachusetts Amherst memorial for Agha Shahid Ali in the spring of 2002, when she was an MFA student there. I first met Kashmiri-American writer Agha Shahid Ali in 1996 in the downstairs commons room in Adams House, at Harvard University. It was a winter evening in Cambridge, and I braved the cold to attend his reading with Robert Pinsky, sponsored by the Grolier Poetry Book Shop. In my memory, Shahid is wearing a Nehru collar shirt or jacket, something pale in color, and he glows, the way the snow glows on certain nights in the winter. He must have been reading poems from his forthcoming collection, The Country without a Post Office, which held the political violence in Kashmir as its backdrop. I can hear him reciting one of my now all-time-favorites from the book, “Farewell,” in which “The paddle is a heart; it breaks the porcelain waves … My memory keeps getting in the way of your history.” Shahid made the audience laugh throughout the reading, before and after reciting his beautiful and serious poems. When I spoke to him afterward, he was kind and encouraging. I told him I had just applied to the MFA program at UMass Amherst, where he was teaching, and that I hoped to study with him. Come, come, he said. Shahid had previously taught at Hamilton College, in Clinton, NY, among other schools in the U.S. and India. Hamilton is a couple of hours from where I had grown up in Rochester, and Shahid and I knew a Rochester-area South Asian academic in common. Shahid once told me that when he landed in that remote part of central New York state, he called upon everyone—poets and professors—who lived within a couple of hours, to say he had arrived. Shahid was warm, charismatic, and irreverent. I fell for him the way you fall for someone across the room at a party and then feel compelled to approach. I had not read his poetry extensively at the time, but as soon as I saw and heard him in Cambridge, I was transfixed. My name was a part of his name—I decided it was destiny. Knowing almost nothing about Kashmir and the Indian military occupation, I thought of Shahid as simply an Indian American writer. I think I had hoped to find in him a mentor. At the time, I had met only one other South Asian writer: Bengali American writer Bharati Mukherjee, who declared herself an American writer only and rejected any hyphenation or descriptor as South Asian. In the mid-1990s, while I was a student at Wellesley College, I attended a reading of hers at Waterstones in Back Bay, Boston. Other South Asians were in the audience and we looked at each other with interest and at her with a kind of hunger. The landscape was different then. This was before Jhumpa Lahiri won the Pulitzer; before Salman Rushdie curated the 1997 summer fiction issue of The New Yorker, heralding South Asian writers’ arrival by the powers that be; before the UMass Amherst MFA program’s own Kamila Shamsie published the first of her several novels; before I met my own second cousin, Suketu Mehta, in Bombay, where he was researching his first book, Maximum City. When I arrived in Amherst in the fall of 1997, I asked Shahid if I could take his poetry workshop. It was more unusual then for poets and fiction writers to take workshops in genres other than their own (it is a requirement now), but Shahid ignored the genre tribes and factions and welcomed me into his class. Sure, he said. Why not? 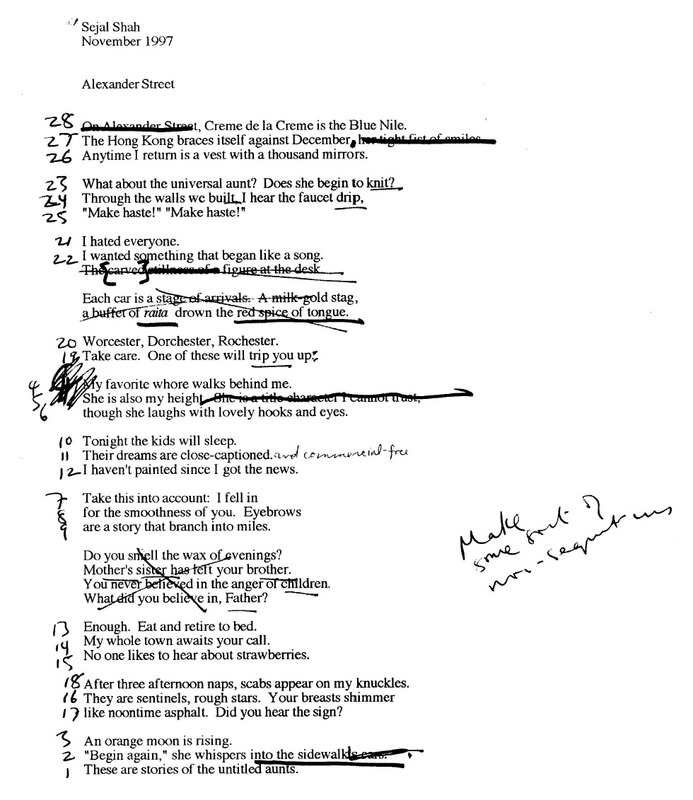 “Alexander Street”: the best example I have of Shahid’s strategy of extensive re-ordering to break a reliance on strict narrative or to suggest other directions in which a poem could move. 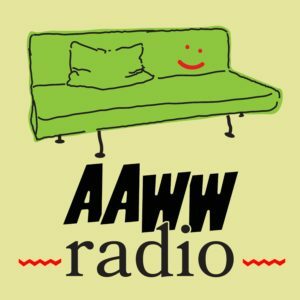 Our class was large and included someone from the local community as well as the poet Kevin Goodan, who was not yet enrolled in the MFA program and would commute up to Amherst from New York City once a week. In workshop critiques, around a long, rectangular table, Shahid often rewrote our poems, starting from the bottom, working his way to the top. He suggested new possibilities for each of us, and read them in his lilting voice. This rewriting occasionally hurt my feelings, bewildered me, and sometimes made me furious. I remember the extensive re-ordering of my poem “Alexander Street” in Shahid’s distinctive handwriting in fountain-pen ink. In that poem, the first line became, instead, the 28th. 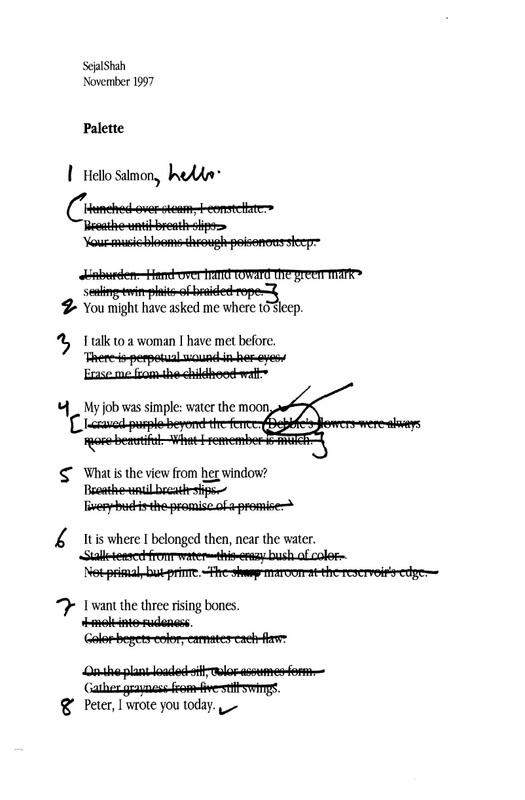 Shahid crossed out so many lines in another poem, “Palette,” that out of the original 25 lines of the poem, only eight remained. 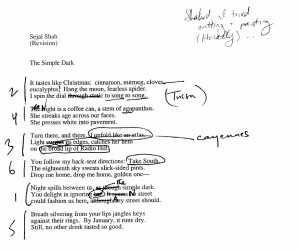 In “The Simple Dark,” which I had revised once, he re-ordered the stanzas to 2-4-3-6-1-5, taking a late verse and moving it up to the beginning of the poem and shuffling the rest. I was horrified, mortified, semi-stunned. I had never seen someone take my writing apart, line by line, and so swiftly dismantle the basic architecture, what I thought of as the poem’s intention. Still, despite my discomfort, I could see that Shahid was doing something interesting. I must have realized I needed to pay attention, because even after 16 years I’ve held on to all of Shahid’s written comments. 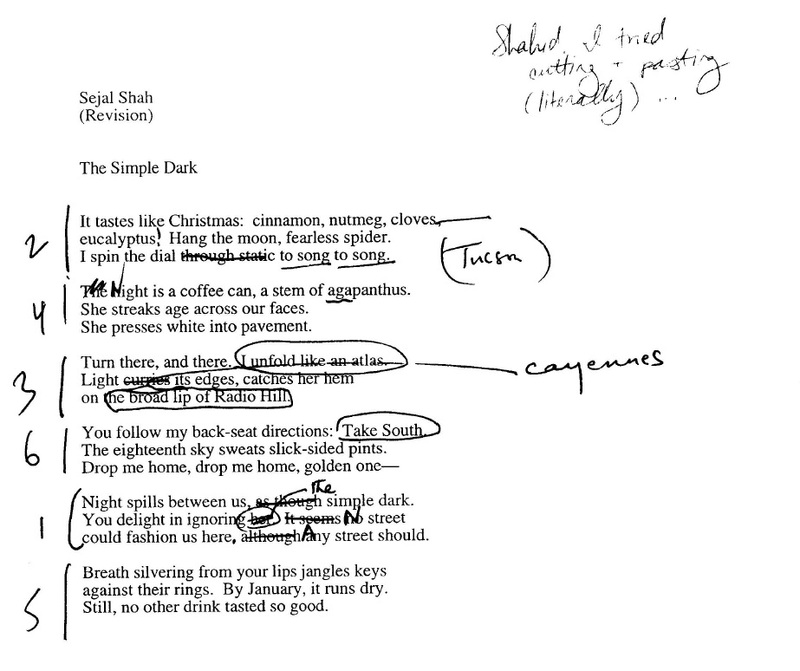 In “The Simple Dark,” I have already revised the poem once and Shahid suggests another re-ordering. One month into the semester, Shahid delivered a piece of advice to me, announced to our entire workshop: Never use the word ‘soul’ in a poem! he declared. I had just brought in a villanelle, “Onyx, Obsidian, Phlox, Coal,” in which “soul” was one of the repeating end words. I have remembered his dictum through the years and have heard myself saying it to my own students: we want our poems and stories to be soulful—to have qualities of the infinite in them—but it is difficult for the word soul to do the work of that desire, particularly in undergraduate writing. Though regularly miffed by his handling of my poems (Where was the unadulterated praise?! ), like everyone, I was still taken by Shahid and admired his exquisite poetry and generous nature. In the workshop, he would recite each one of our names as though it were a poem, brilliant, somehow miraculous and mysterious, complete and gorgeous in and of itself. Daniel, he’d say, delightedly, Daniel Haaaales. (He loved Daniel Hales’ name, but in truth it seemed as if he loved all of our names.) It’s the wonderful Kelly Le Fave. Kevin Goodan. James Heflin. Carrie St. George Comer. Andrew Varnon. Robert N. Casper. Shahid believed in gathering everyone together, in joy. After our workshop sessions, he would suggest we continue the conversation over drinks in town at the Amherst Brewing Company. This, I thought, is graduate school. I didn’t realize then, that this was actually just Shahid. Twice that fall, he invited us and other friends over for hours-long, sprawling dinner parties. People spilled over from room to room—Shahid had many friends and admirers, and we all basked in his glow. When I offered to help cook for one of his parties, Shahid laughed and said, You American-born Indians are the most terrible cooks. I was taken aback, but I had to laugh, too. One night, when the stove burners were not working and the food had to be warmed up elsewhere, Shahid charmed us as any good host would, playing Hindi film music and ABBA. No one minded not eating for a while—we may not have even noticed. I remember he broke into song. Hey, I said, I know that song, and began dancing in his Northampton home, performing the Bharata Natyam Indian classical dance steps I had learned as a child. Shahid clapped his hands in encouragement. Vah, vah! he said. Finally—the subcontinental applause I had sought. To my subcontinental darling across the continents—love—of course. with long dashes on either side that spanned the width of the page. And now, where is lipstick? Who else could have written about the purple lipstick I wore that year at his book signing, when all of us had crammed into Wootton’s, a small bookstore on North Pleasant Street in downtown Amherst for the Best American Poetry reading—and in a way that makes it seem like a poem? I cannot imagine my time in the MFA program without Shahid—without those warming dinner parties in wintry Massachusetts, without remembering our poems unwritten, in order for different possibilities to be imagined. 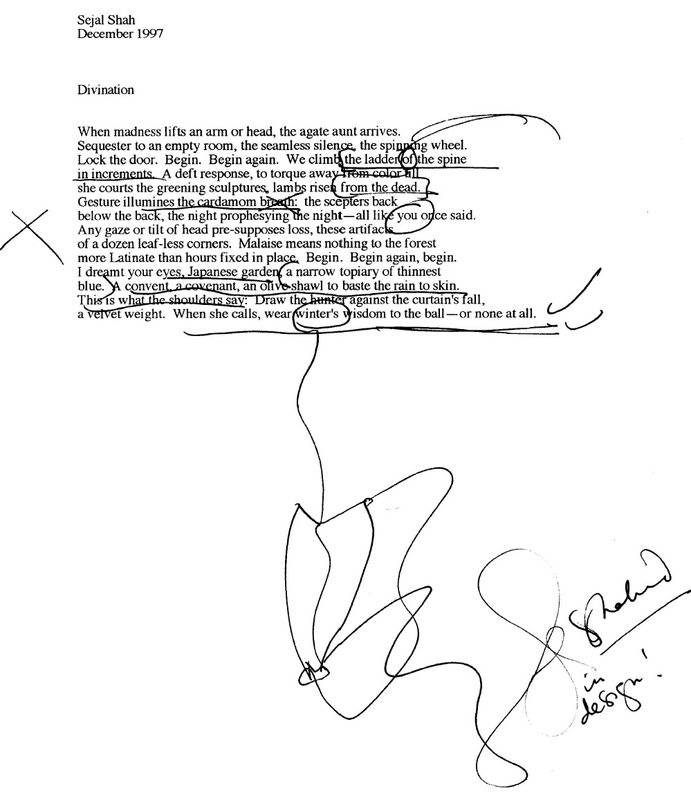 “Divination”: my final poem of the semester and no entire lines crossed out! There’s a big X off to the side (perhaps suggesting something he didn’t like), several underlined phrases, and a lovely Shahid drawing. As a professor and teacher myself for over a decade now, I understand his rewriting, painful as it was for me, as another form of attention, even as another kind of love. 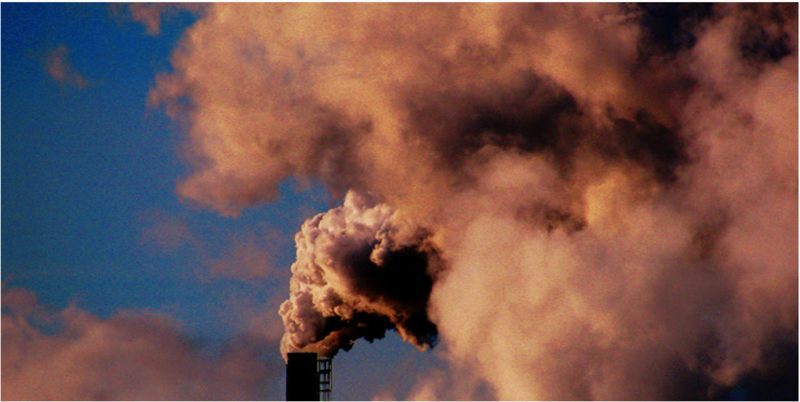 It is a strategy I utilize—unwriting, rewriting, undoing—in the workshops I now teach. I think of Shahid when I attempt to respond to students’ poems honestly, generously, usefully. It’s much easier to shy away from the declaration that a poem is not quite working and to instead merely praise what is easily praise-worthy, but what has stayed with me all these years is the more honest, if sometimes ego-bruising, critique. I can see now he was trying to lessen my dependence on strict narrative, my desire to tell a story within a poem, and to instead allow the poem to unfold, to breathe, to surprise, to live, through the generation of lyric possibilities. During my first year of graduate school, Shahid was the director of the MFA program and I had reason to call him once or twice, at home. His answering machine message was simply, I knew you’d call, emphasis on the “knew.” There was no preamble. The first time I heard his message, I hung up. Shahid had, as usual, caught me off guard. His outgoing machine sounded like a line from one of his poems, like a moment of delight, of enchantment. Hearing his voice left me smiling and speechless. Shahid’s message was to the point and too short—like his life. There was no time to think of what to say, to fill the space with unnecessary words. We flocked to him: students, poets and writers, ambitious dreamers. Even now, I see him in his Northampton kitchen, turning toward me in a royal blue sweater. I’ve caught him off guard in this picture, but he’s still posing, still gesturing, still lovely, still young. He would probably hate me saying so, but I think his eyes look soulful. I knew you’d call. 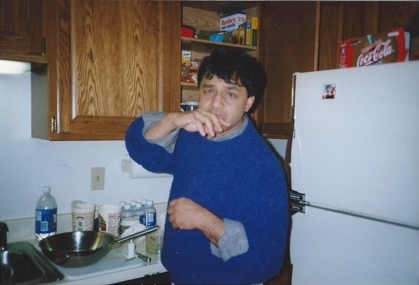 Shahid at home in his kitchen in Northampton, MA, in fall 1997. Photo courtesy Sejal Shah. Sejal Shah 's writing has been nominated for a Pushcart Prize and for inclusion in Best American Essays. 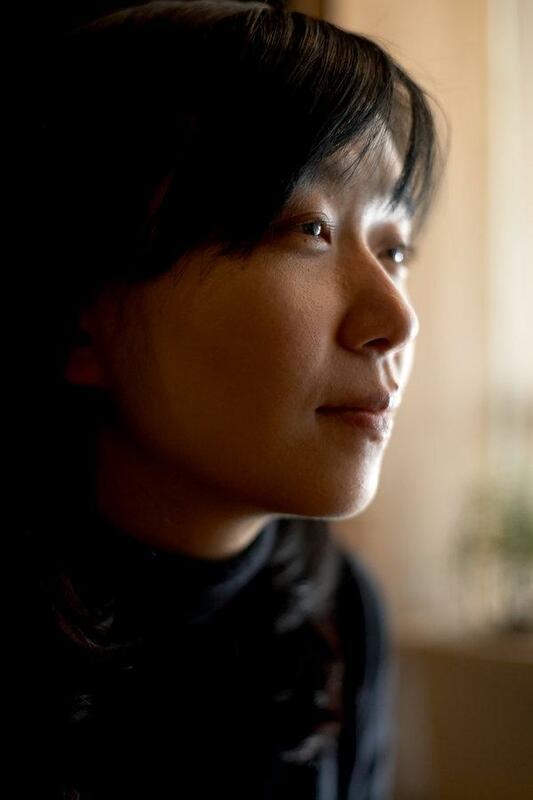 Her stories and essays have recently appeared in journals including The Asian American Literary Review, Brevity, The Kenyon Review, The Literary Review, and Web Conjunctions. She lives in Upstate New York and teaches creative writing at the University of Rochester and English at the Harley School. Visit her online at www.sejal-shah.com.